I went to open the safe, typed in my code, and the pad blinked once and faded out… I thought the battery might be dead, so I popped open the dial, and what did I see? The small buzzer that is in the keypad sitting on the bottom of the dial. It somehow fell off of the circuit board. It looked like the wires just snapped… Maybe a change in temperature caused it? But the keypad sure doesn’t work any more. I called AMSEC and when on the phone, they immediately agreed to send me out a replacement ESL5 Keypad. It sounded almost like they knew exactly what I was talking about, so I’m wondering if this is a known issue or something they were aware could happen? But in any case, they agreed to send one out, with one-day shipping (actually took 4-days because of the weekend). I finally got the new keypad, and well, it looks like they have been redesigned. 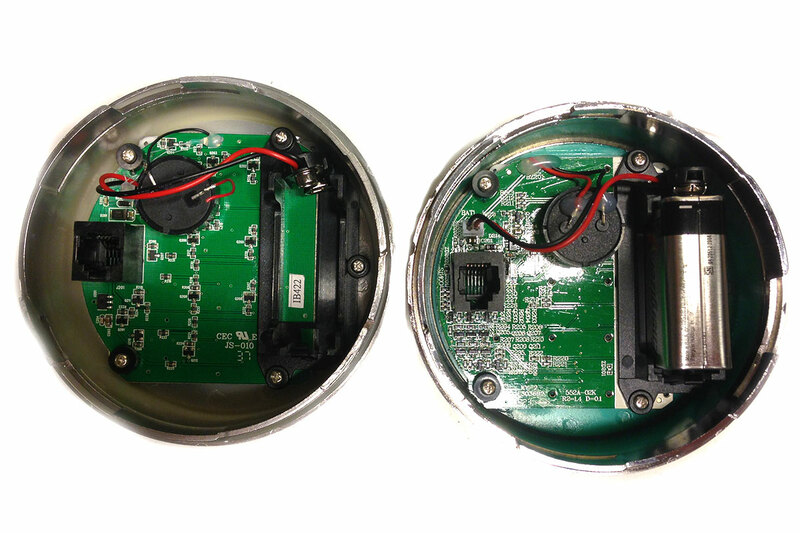 Take a look at the picture below, the unit on the left is the old, the one on the right is the new one. Unfortunately, my fears were correct… I plugged in the new keypad, typed in my code, and … nothing. The combination doesn’t work… Another call to AMSEC, after hours of course. After talking with the tech, they had me do a few reset procedures, and then try the default code. Somehow we reset the code to be the default code (or it was reset to the default code during all of the keypad switches), something that does not lend well to the overall security of the safe. If you can “reset” the code without being inside the safe, there is a security issue. But after about 10-15 minutes of playing with it, I was back into the safe, with the code reset, etc. So what does this tell me? 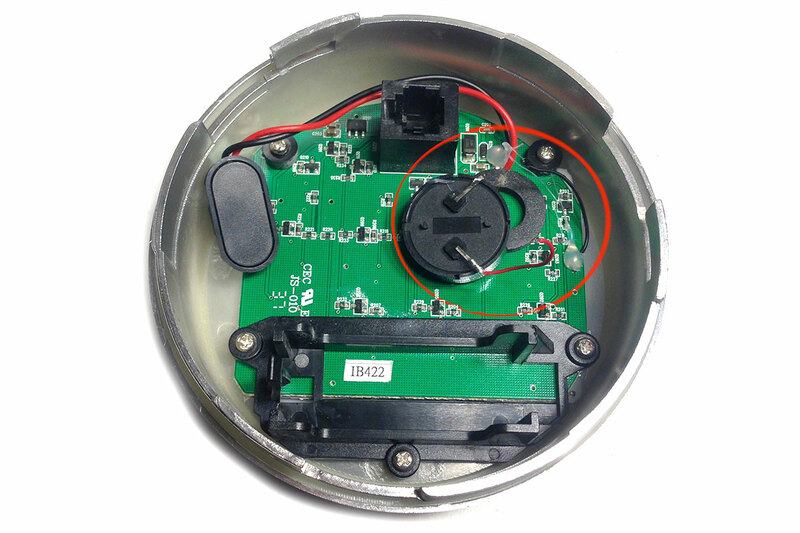 Electronic safe locks, such as the ESL5, are susceptible to code reset attacks. Not something I’m happy about learning after the fact. So in short, probably get a dial lock on your safe. Old fashion locks seem to be the “safest” way to go, and there are no circuit boards to die on you. They are slower to get into, but you wont have the same issues. Have you had issues with a safe with an electronic lock? Let us know about it and share your pain! I bought two Amsec safes in May 2011. I went in intending to get combination entry safes. I let them talk me into keypad entry safes. One stopped working after 4 years 4 and a half months—and I wasn’t even into it more than ten times in over 50 months. My first thought—replace the batteries. I did a tongue test on the “old” batteries, they seemed to have lots of power. Still I went and bought some five year rated alkaline batteries. After installation (not really easy, the fit is way tight) still no function. No sound, no light, nothing. Now I am resolved to get this “modern” garbage replaced with “non-stylish” and “not with it” and “out of date” and “behind the times” old style combination locks. I believe the keypads are a scheme to bilk the public by setting them up to fail, possibly due to changes in humidity. My understanding is that in an electro-magnetic pulse event, natural or man made, nothing electronic is likely to work. 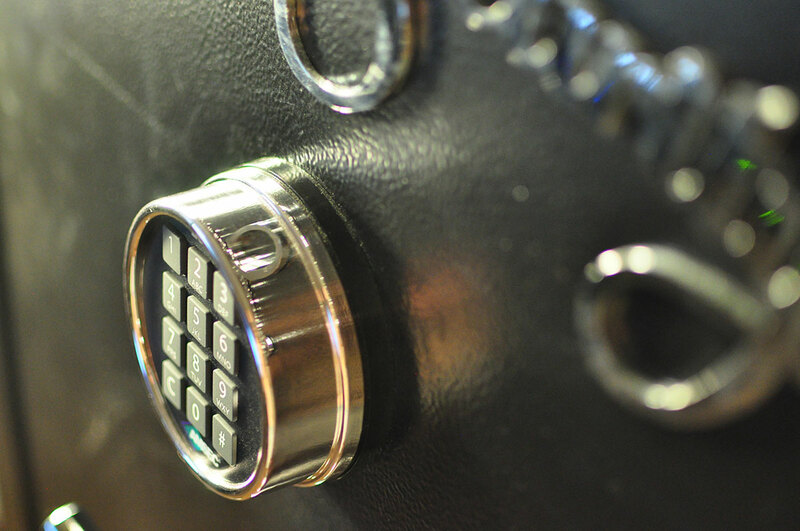 When I have the safes converted to combination locks, the company that talked me into keypad entry safes will not get that bit of business. I can’t remember my code…what do I do? I have the same problem. ESL 10 Keypad not functioning. Red light no longer lights up. Only the “C” beeps, no other key makes an audible sound, and of course the safe does not open (yes I changed the batteries). I called Amsec and they said mine cannot be opened with a reset code. I took the keypad to the safe company I bought it from, they tested it on a safe and the keypad worked just fine. I am told it will have to be drilled. I have had the safe for just under 5 years. Those digital locks are convenient and great right up until they are NOT. Currently, I am not in the least bit impressed the digital locks. I will absolutely be replacing it with a dial. I can’t believe they can get away with selling that kind of junk on a top end safe. Sounds like you “lucked out” and got some seriously faulty electronics. Definitely concerning, maddening, even infuriating. Good luck getting things fixed up, hopefully it goes smoothly. I changed the batteries and the keypad appeared dead. I don’t know why I tried this but held the C and # at the same time. I continued to hold the C and released the # then let go of the C (I made the mistake of hitting the C again and it didn’t work) then the number and #. IT WORKED!!!! I’m having the same problems. Unfortunately I replaced the key pad and no luck. Talked to two locksmiths and both told me it’s a very common problem. I’m switching over to the cylinder at this point. AMSEC was actually nice but refused to cover anything. Safe is 4 years old and very disappointed that a main mechanism fails like this. And yep, I received two overrides from AMSEC neither worked – but surprising I received those from a security standpoint. I’m stuck with the dead battery situation, new ones don’t work. Will check with installer tomorrow. Paid over $5000 a few years ago for the digital convenience and got this! Call Amsec! They can help you.